Lately, I’ve been thinking about “investing” in the clothes and things that I purchase. Not so much the act, but the term itself. This was a word that used to be used a lot more frequently this way. After the recession everyone seemed interested in “Made in USA” goods, quality, craft and investing in pieces for the long-haul. Menswear and style were even dovetailing with these ideas, and culture seemed obsessed (or at least interested) in quality over quantity. That trend has sort of faded, but I still think about it a lot, especially when I travel. I must have first come across “investing” in this way on A Continuous Lean, and I’m sure I thought it was a bit hyperbolic, maybe even pretentious. Today though I consider myself a fully-committed subscriber the approach. 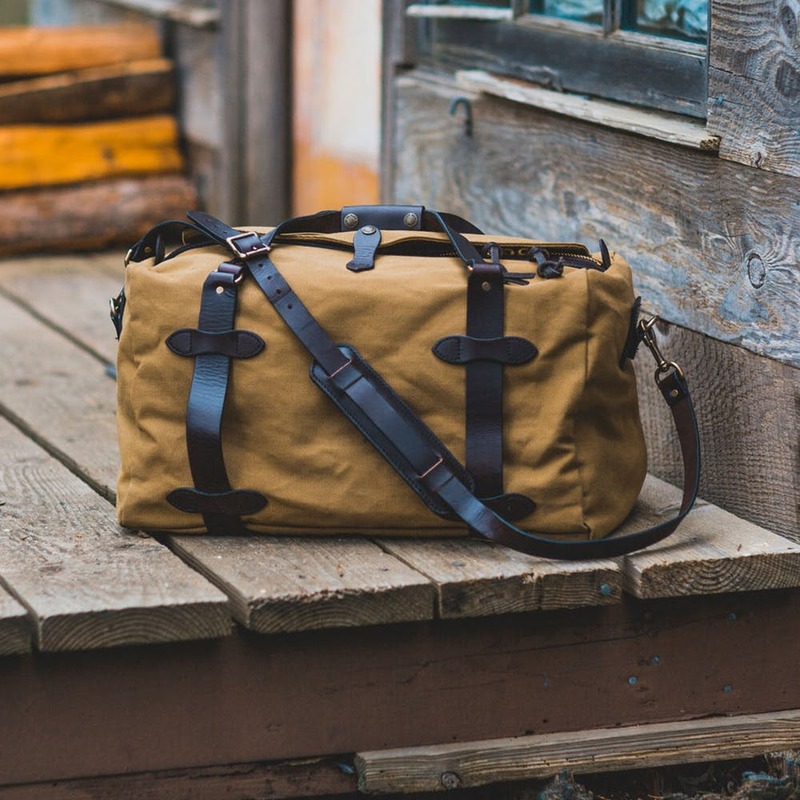 It was also on ACL that I remember seeing a Filson duffle bag for the first time and it was the first time I wanted to invest in a product that would spend decades with me. Admittedly this may have just been my justification for splurging, but ultimately it was a good one. It turned out to be a sensible thing to do. The canvas on the duffle was heavy and stiff. The details - leather and brass fittings - were rugged and the leather would undoubtedly take a long time to break in to become soft and supple. It had a simple design, one main compartment with an interior pocket, and that’s it. The straps were long enough to wear backpack style if I needed to hoof it in a pinch and they stretched a bit under a heavy load, which was comfortable. I knew this simple design was beneficial. It would mean there was less to break over time. And, I reasoned, the bag would even acquire a kind of “patina” that would make it uniquely mine. So of course I went for it, in dark green. It was a splurge but the bag has been with me almost a decade now. While the canvas has faded slightly, it shows very little wear despite crossing countless time zones and borders, being tossed out of baggage holds and no doubt dropped onto a runway or two. I always kind of laugh to myself when I see it tumble down the baggage shoot onto the carousel like a mushed bag of potatoes. I don’t carry anything in it too fragile so I don’t mind. I just pick it up from the sea of identical-looking roller bags circling the conveyor belt, give it a couple kicks to get it back into shape, clip on the shoulder strap and head off. Recently, in a moment of roller bag marketing capitulation, I did acquire a hardshell suitcase to use instead of the duffle. I reasoned I needed something to carry a suit, and I do, but even before we left for the trip I realized that this new case wouldn’t last for the long haul. It looks sleek and can roll, but its cheap plastic parts surely won’t endure nearly as much abuse as my beloved duffle. I’m guessing it will give me three years or so of service if I’m lucky. So now when I travel I’m back to my canvas duffle, my old faithful. I don’t travel with suits all that much so it really doesn’t matter. Plus, that’s what dry cleaning and hotel irons are for. And while I’m wistful about the days I purchased this bag - when an emphasis on quality was put on lasting products - I’m supremely comforted that I still have the bag, and will for a very, very long time. At this point, I’d say the investment has paid off.